3 teams of 5 player, with 1 team defending and 2 teams keeping possession. 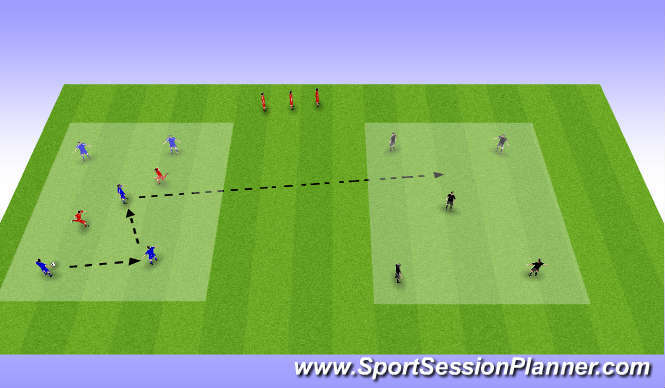 The defending team send 2 players into one of the boxes and attempt to win the ball back/clear the ball out of the box. The attacking teams keep possession and look to make 10 passes before transferring to the other box. 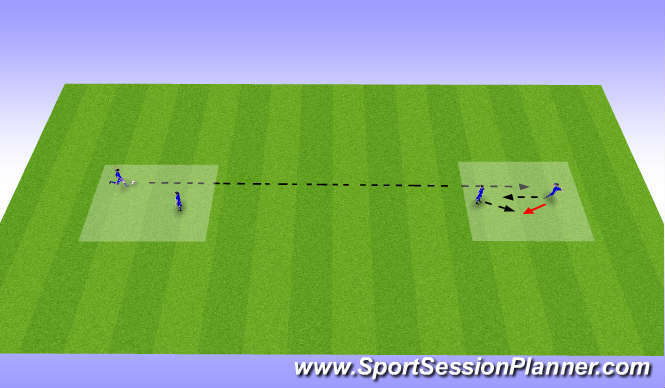 If the ball is successfully transferred, 2 new defenders enter the area whilst the other defenders recover to the start position. Defenders can start in the middle zone and look to block passes to the other box. The game is played for a set time and the defending team score a point for every time they successfully win the ball. Each team has an opportunity to defend, the team with the lowest score loses the game. 2 teams of 7, the blue team has the GK and looks to keep possession whilst the red team attemots to win the ball back and score in any of the 4 goals. Blue team scores a goal if it has make 10 consecutive passes, red team scores by regaining the ball and scoring in any of the 4 goals. Play for a set time and then the teams change roles. Blue team line up in a 3-3-1 formation and look to score by dribbling the ball through the cones beyond the half-way line. Red team line-up in a 2-3-2 formation and attack the goal. 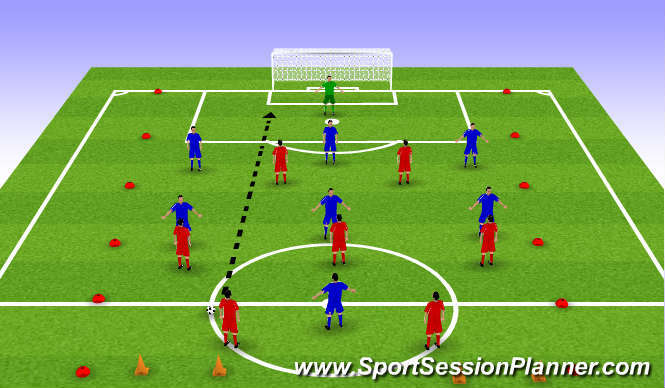 Practice starts by a red defender over-hitting a pass which runs through to the GK, and then the blue team play out. Coach the red team to defend effectively. Progress by allowing free play once defensive principles have been established and allow players to change roles.